Update december 2008- instructions for items in this set can be purchased here. 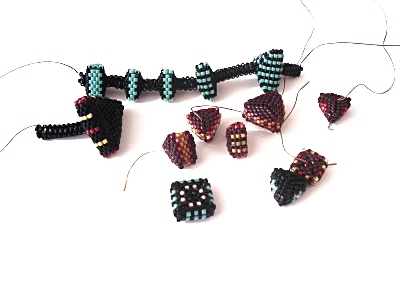 My Geometric Beadwork Series grew out of a love of experimenting and playing around with stitches. When I first learnt to bead, I did a lot of beadwork that was other people's designs. However, I soon wanted to make my own designs and began experimenting. Whilst beading one of my first pieces, and playing around with peyote stitch, I was happily beading a circle, increasing as I went, when I had the 'light bulb' realisation that as soon as I stopped increasing, my work would sprout sides and a vessel would form. Almost immediately I realised that if I put the increases in certain places I could change the shape of my work. That was around February 2001 and I began playing around with this idea and made some samples, but for a long time did nothing more with them. A few years later, I came back to my samples and my Geometric Series was born. The pieces in the series are named depending on the number of sides they have and the type of piece they are. One of the first things I did was turn those original samples into a piece of jewellery.